Unidoor 30 inch W x 72 inch H Shower Door in Chrome is rated 4.9 out of 5 by 54. Rated 5 out of 5 by HomeDepotCustomer from Exactly as described! A great purchase and easy to install!... Exactly as described! A great purchase and easy to install! Rated 5 out of 5 by Jeff from The shower door was easy to install....very happy with the product. It was so much cheaper than ... The shower door was easy to install....very happy with the product. It was so much cheaper than the quotes I was getting from glass companies. Rated 5 out of 5 by Susan from Just beautiful! No need for a custom door, this... Just beautiful! No need for a custom door, this is perfect. Saved a load of $$$. Rated 5 out of 5 by Maria from Very happy with the results. This shower door was easy... Very happy with the results. This shower door was easy to assemble as long as you have 2 people. What are the hinge plate dimensions for this door? I am mounting on a fiberglass enclosure. 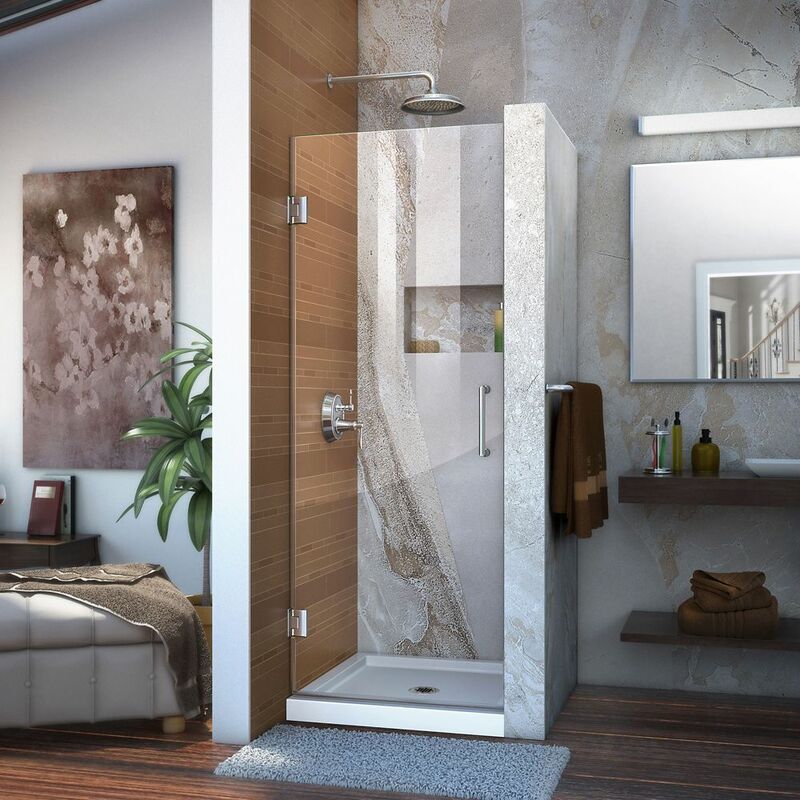 All DreamLine shower doors and enclosures require smooth, solid finished walls, 90-degree angles where the wall meets the threshold and finished walls that are at least as tall as the shower door or enclosure. If the walls of your enclosure have any give or flex to them when you push on the wall, most likely there is a pocket of dead space behind the wall and the wall is not solid. Please make sure that your shower meets the requirements for installation before making your choice. The Unidoor also requires that you have double studs or blocking directly behind your finished walls. The hinge plates are appx. 2&quot; by 3&quot; in size and begin appx. 6&quot; up from the threshold and 6&quot; down from the 72&quot; height. If you have any other questions, please contact the DreamLine Customer Support Team at 866.731.2244. We are available 8am-7pm EST, Monday through Friday, and Saturdays from 9am to 5pm EST and will be happy to answer any questions you may have. You may also send an email to support@dreamline.com. Thank you for considering DreamLine!